1. Start by cutting a whole napa or Chinese cabbage into smallish pieces and then wash them well before sprinkling a few tablespoons of salt evenly over the leaves. 2. Immerse the salted cabbage leaves in cold water in a sealed container and leave overnight in the refrigerator. 3. The following day, drain the cabbage leaves and rinse well. Add the cabbage to a large plastic bowl and then add approximately one tablespoon each of finely chopped garlic, ginger and spring onions. You also need to add about one spoon of crushed chilli and a tablespoon each of salt and sugar. 4. Mix the ingredients together well in the plastic bowl. Rubber gloves can help with the irritation the chilli may cause on your hands. Make sure to rub the seasonings all over the cabbage leaves for even distribution of flavours. 5. Once the seasonings have been added to the cabbage, you can place all the cabbage inside a sealable glass container and leave it at room temperature for 2-3 days before eating. This period will allow the cabbage to ferment giving it its characteristic taste and intense flavour. Remember to leave a small amount of space at the top of the container to allow the kimchi to expand while it ferments. Making Kimchi can be slightly time-consuming due to the time you have to wait for the cabbage to start fermenting. 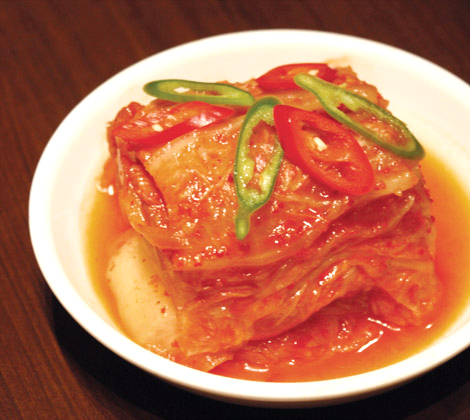 Of course, many people prefer the taste of fresh kimchi which hasn’t been fermented. If you prefer a less strong taste you can eat the kimchi immediately after you make it or after just one day of fermenting. If you don’t have the time to make kimchi from scratch, there are other options for you. Of course, the easiest is to buy premade kimchi packets. You can find these at the Japan Centre food shop in a variety of different flavours, including kimchi made from Korean radish. Your other option is to buy a kimchi sauce base and use that in combination with cabbage to save buying and making the sauce separately. This is a great way to make kimchi as you can still choose the amount of flavour that you want by leaving it to ferment for the right amount of time. Kimchi is best served as a side dish to many Japanese or other Asian dishes. Try it with grilled teriyaki salmon with rice and miso soup, it’s delicious. And don’t forget to store the kimchi in the fridge and it should keep for approximately one month. I think I might try to make this tonight, I’ve always fancied trying it! Hi Emma, did you make the Kimchi and how did it taste??? Thank you for this recipe! Your version sounds much easier than what I’ve seen so far. I’ll definitely give it a try! This is great. My Korean-Canadian daughter-in-law is over the moon. So is my son!